When my sons were born, many friends were kind enough to drop off dinner. I often wondered how I ever would have gotten dinner on the table those first few weeks if it weren’t for the kindness of those dear friends. 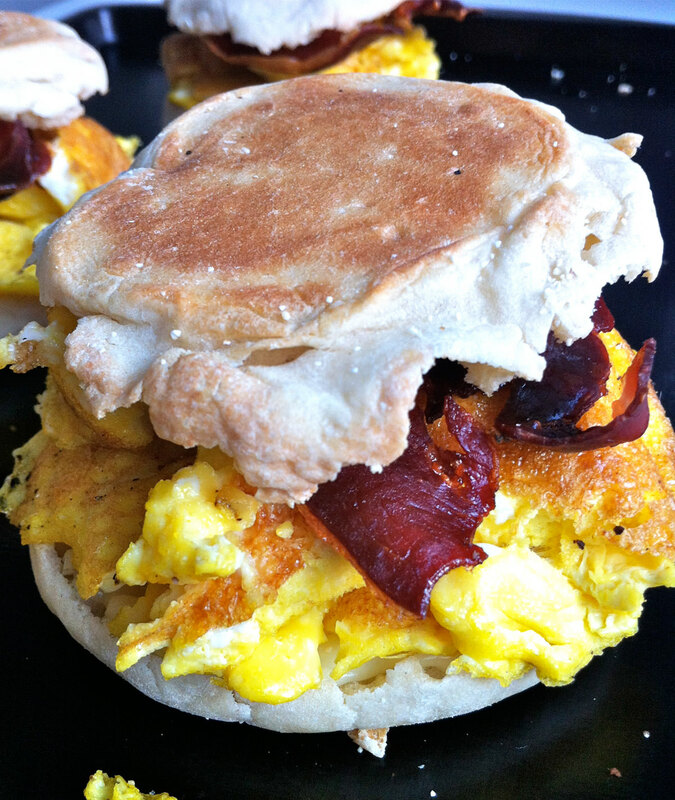 After the birth of my second son, one clever person delivered breakfast sandwiches. I remember wondering, however, if they would really be good the following morning. They seemed like the sort of food that should be eaten immediately. Well, I was wrong to wonder. They were incredible. I’ve made them many times since. I mean, everyone loves a good egg sandwich, right? The only problem is that we don’t often have time to make them in the morning. Sometimes, I make these for breakfast-for-dinner, and I double the recipe and prepare extra for breakfast later in the week. You can even freeze them. The trick to reheating quickly while maintaining good crispness is to open the sandwich and microwave the egg half until barely warm. Then, transfer both halves to the toaster oven until the insides are hot and the bread is crisp. First, bake prosciutto slices on a baking sheet at 350 degrees for 10-13 minutes, or until crispy. Watch closely at the end to prevent burning. I have also discovered that grilling for about a minute produces a perfectly crisp piece of prosciutto with no clean up! Toast the English muffin halves on a baking sheet in a 350 degree over for seven minutes. Remove from oven and place cheese on four of the halves. Return them all to the oven and bake about four more minutes, or until muffins are crisp and cheese is melted. 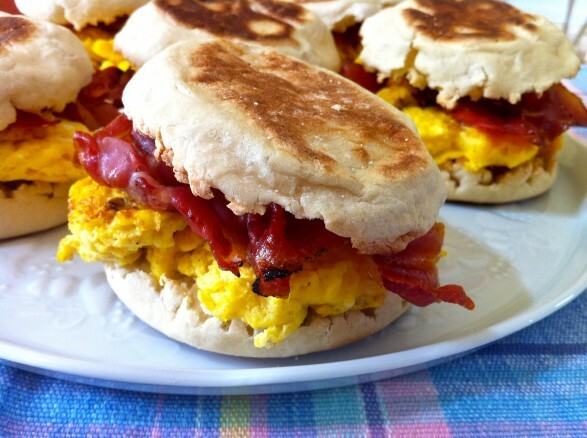 Assemble the sandwiches by placing one quarter of the egg on each of the four melted-cheese muffin halves. Top egg with a quarter of the prosciutto, then top with the remaining muffin halves. Eat immediately or wrap in foil and refrigerate for several days or freeze. Oh these look delicious and yummy. I love the idea of freezing them for a quick breakfast on the go. Thanks for sharing on Newlyweds recipe Linky, be sure to leave a link back to my blog so other’s can join in too. Love these! Perfect for on the go anytime of the day. Doesn’t hurt that my favorites, cheese and prosciutto. Thanks Ann! They do look great. I recently shared a post on faceboook about making bacon in the oven and then freezing it in separate portions. I am wondering, would you add pre-cooked bacon to this? Personally, I do not eat cheese, bacon, however, is another story. Thank you! I think you could certainly add your pre-cooked bacon to these. Reheating in the toaster oven will help crisp it up again. Also, the cheese can easily be omitted. Buttering the bread is an option which some may prefer when the cheese is omitted. Made a big batch of these this week. Ate them fresh, from fridge and even from freezer. All were delicious and so quick and not at all soggy! Both my teenage boys have very late lunch periods, so a hearty, yet quick breakfast is awesome! I was looking through your older recipes yesterday and found so many things I want to try. I started with these egg sandwiches and everyone loved them. Great combination yet so simple! Thank you for the thoughtful feedback and glad you dug up some other recipes to revisit!